Students, faculty and staff can check out tablets from Circulation. You can access the campus wireless network as well as personal and public wireless networks. Tablets circulate with location services ON. You may modify this default setting if desired. This device is intended to access/consume personal content in addition to library content. You may be asked to provide personal information/credit card information to download applications or access your subscribed/streamed content. Circulation staff will erase all personal information plus user-installed apps from the tablet when returned. "I agree to pay all costs associated with damage to the tablet and/or its peripheral equipment or its replacement costs should it be lost or stolen. 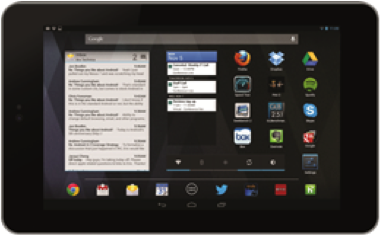 I understand that the replacement cost for this tablet device may be up to $550."